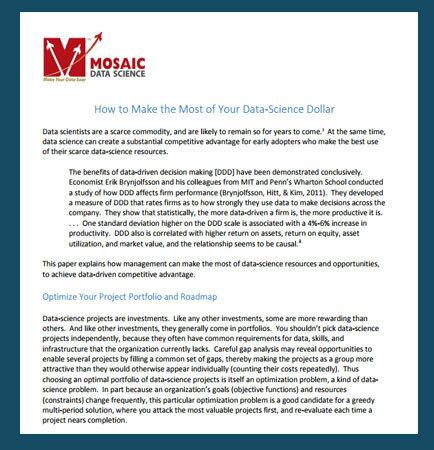 "Data-Science White Paper: Make the Most of Every Dollar Spent"
Data scientists are a scarce commodity, and are likely to remain so for years to come. At the same time, data science can create a substantial competitive advantage for early adopters who make the best use of their scarce data-science resources. data scientists often struggle to recognize that every data-science project is an optimization problem.iii In business the objective function is usually expected value, but sometimes expected value is and should be traded away to avoid the possibility of catastrophic losses. Data science has a long, highly technical learning curve. An inexperienced team with limited background has two ways to shorten its learning curve. The first is training. For example, Coursera offers a series of online classes designed to train data scientists in specific computational techniques and tools. This paper explains how management can make the most of data-science resources and opportunities, to achieve data-driven competitive advantage.